I depart from London on the January 29th 2012. I will try to limit the numbers of flights to really make the most of each country. I plan to stay around a month in the States, three weeks in Mexico and 3 months in South America. Then, I'll see! I intend to leave with a budget of 10 000 euros budget that I've been building up for more than a year. I will have to be very careful with the management of this budget as it might be a bit tight to survive for 365 days. I will use the website Couchsurfing website on which I registered last year and which is a great mean to meet natives and locals cheaply. Encounters which should influence my itinerary a great deal will be a driving force during the journey. 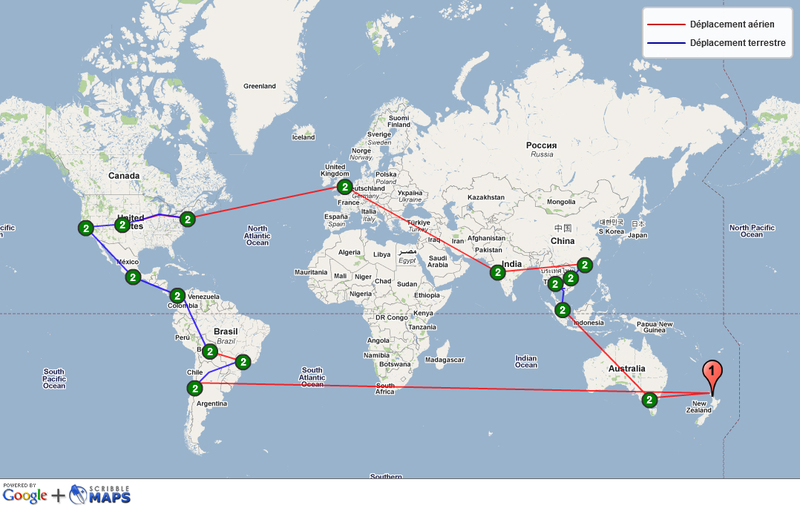 I've tried not to have a too precise itinerary to have the freedom to travel with the people I will meet on the way. Through the discovery and the exploration of cultures in each country I'd like also to get involved in humanitarian teaching. I will get in touch in the next few months with orphanages and schools in India where I'd like to stay two months. The creation of this website a few months before my departure is not only aimed at my relatives, it's aimed at those who are curious and passionate about travelling. Through these pages I hope to inspire those with doubts about travelling and inform backpackers to help them preparing their own trip. Finally when I get back hope to edit the footage I will have captured during the trip to make a film and put together an exhibition showing the important stages of this journey.